iPhoneIslam, makers of one of the first arabization apps for the iPhone, released their integrated Arabic keyboard for the Apple iPad and it’s called Arabtaller iPad. The difference between Arabtaller iPad and standalone keyboard apps is that it’ll work with any apps as it is an integrated keyboard. To install Arabtaller iPad you need to jailbreak your iPad. Remember that any update to the iPad OS will remove the jailbreak as well as Arabtaller iPad. 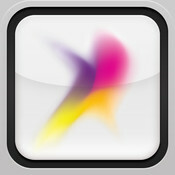 We take no responsibility for any problems that may happen when you jailbreak. Arabtaller iPad cost USD$10. I believe this is expensive compared to other non-jailbreak, standalone keyboard apps and The fact that Apple will add Arabic keyboard to the iPad soon. If you can’t wait; willing to jailbreak your iPad; and have no interest in upgrading to iOS 4 later then you can buy Arabtaller iPad from this page. The iPad currently reads Arabic but it only supports 9 keyboard languages: English (U.S.), English (UK), French (France, Canada), German, Japanese (QWERTY), Dutch, Flemish, Spanish, Italian, Simplified Chinese (Handwriting and Pinyin), Russian. As for the iPhone it supports over 30 languages: Keyboard support for English (U.S.), English (UK), French (France), French (Canadian), French (Switzerland), German, Traditional Chinese (Handwriting, Pinyin, Zhuyin, Cangjie, Wubihua), Simplified Chinese (Handwriting, Pinyin, Wubihua), Dutch, Italian, Spanish, Portuguese (Brazil), Portuguese (Portugal), Danish, Swedish, Finnish, Norwegian, Korean, Japanese (Romaji), Japanese (Kana), Russian, Polish, Turkish, Ukrainian, Estonian, Hungarian, Icelandic, Lithuanian, Latvian, Flemish, Arabic, Thai, Czech, Greek, Hebrew, Indonesian, Malay, Romanian, Slovak, Croatian, Bulgarian, Serbian (Cyrillic/Latin), Catalan, and Vietnamese. The iPad is missing over 20 languages and Apple will release an update in the next few months to add these languages. 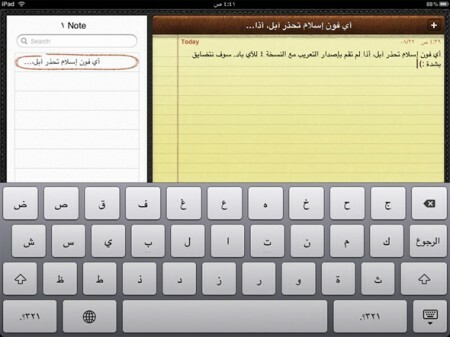 For the time being I personally recommend getting this free Arabic keyboard for iPad app. It’s worth noting that there is a Greek and Hebrew keyboard via jailbreak solution named OpenHebrew, it cost $8 so $10 for the Arabic is comparable. Next: Asking the readers: How to recharge the 3G sim from mobily on iPad? over 20 languages are missing from the iPad. it’s not a discrimination against Arabs. Wanna know what’s discrimination? Office for Mac can’t create Arabic documents but it can open and edit Arabic docs created in Windows. iOS 4.2 will add it. It’s not as simple as changing the size of the keyboard though.